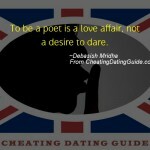 To be a poet is a love affair, not a desire to dare. His fingerprints covered my skin. He was the one I compared all others to. It was as if we’d known each other for a thousand years.